Config Server Firewall / CSF is firewall application suite for Linux servers. CSF is also a Login/Intrusion Detection for applications like SSH, SMTP, IMAP, Pop3, the "su" command and many more. CSF can e.g. detect when someone is logging into the server via SSH and alarms you when this user tries to use the "su" command on the server to get higher privileges. It also checks for login authentication failures on mail servers (Exim, IMAP, Dovecot, uw-imap, Kerio), OpenSSH servers, Ftp servers (Pure-ftpd, vsftpd, Proftpd), cPanel server to replace software like fail2ban. CSF is a good security solution for hosting servers and can be integrated into the user interface (UI) of WHM/cPanel, DirectAdmin, and Webmin. CentOS 7 (my server uses the IP 192.168.1.101). Install the dependencies for CSF. Please go to the "/usr/src/" directory and download CSF with wget command. You should get the information that CSF installation is completed at the end. Now you should check that CSG really works on this server. 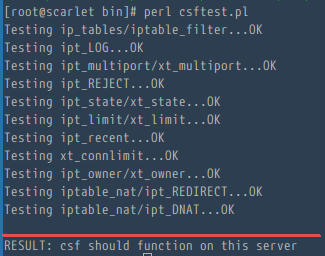 Go to the "/usr/local/csf/bin/" directory, and run "csftest.pl". Before stepping into the CSF configuration process, the first thing you must know is that "CentOS 7" has a default firewall application called "firewalld". You have to stop firewalld and remove it from the startup. Change line 11 "TESTING " to "0" for applying the firewall configuration. By default CSF allows incoming and outgoing traffic for the SSH standard port 22, if you use a different SSH port then please add your port to the configuration in line 139 "TCP_IN". 2. Flush/Stop the firewall rules. 3. Reload the firewall rules. 4. Allow an IP and add it to csf.allow. 5. Remove and delete an IP from csf.allow. 7. Remove and delete an IP from csf.deny. 8. Remove and Unblock all entries from csf.deny. Here are some tweaks about CSF, so you can configure as you need. 1. Don't Block IP addresses that are in the csf.allow files. By default lfd also will block an IP under csf.allow files, so if you want that an IP in csf.allow files never get blocked by lfd, then please go to the line 272 and change "IGNORE_ALLOW" to "1". This is useful when you have a static IP at home or in office and want to ensure that your IP never gets blocked by the firewall on your internet server. 2. Allow Incoming and Outgoing ICMP. 4. Send the Su and SSH Login log by Email. You can set an email address that is used by LFD to send an email about "SSH Login" events and users that run the "su" command, go to the line 1069 and change the value to "1". And then define the email address you want to use in line 588. If you want more tweaks, read the options in the "/etc/csf/csf.conf" configuration file. CSF is an application-based firewall for iptables provided for Linux servers. CSF has many features and can support web-based management tools like cPanel / WHM, DirectAdmin and Webmin. CSF is easy to install and use on the server, it makes security management easier for sysadmins. I am having problem w csf. When I flush default rules, they are being added autmaticly after ~10-30 minutes. I want only to use this firewall for blacklist/whitelist IP and countries. How to configure it propetly to use it only for this functions? How to block a range of IP from one country? at "2. Flush/Stop the firewall rules", the command should be csf -r, not csf -f.
Very nice and concise tutorial. I suggest that questions about specific configuration be asked on CSF specific support site. This blog explains the setup and core settings to get a clean start. Thank you for the notice. I've corrected the tutorial.